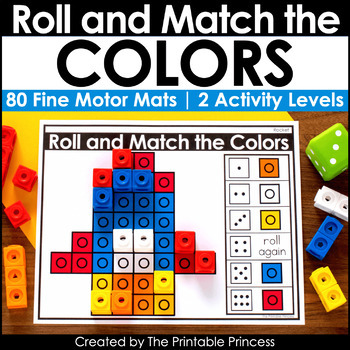 Roll and Match was designed to be a fun, hands-on way for students to practice fine motor skills as well as matching colors and color words. It makes a great independent activity or partner game. A total of 80 mats - 2 differentiated versions: color matching (40 mats) and color words (40 mats). This resource includes 40 unique picture mats. Each picture mat includes two options, for a total of 80 mats. There are 40 color cube matching mats and 40 color word matching mats. Year round themes - eight themes are included: clothing, food, monsters, pets, pirates, outer space, sports, and transportation. Each theme has five activity mats. The picture name for each activity mat is located in the upper right corner. No recording sheets are needed so students can use these as morning tub activities, centers, early finishers, indoor recess, or just for fun. Preparing the Activity: The mats are easy to prep. Just print on cardstock and laminate for durability (or slide in a page protector). Also included are two “I Can” visual directions pages. Students will need a dot cube and color corresponding plastic cubes. 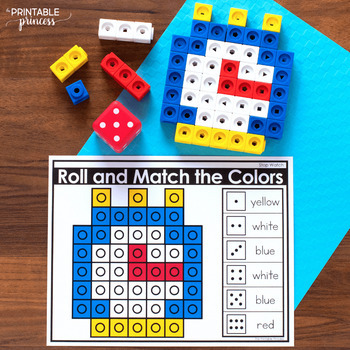 Activity Directions: Students will roll a dot cube and identify the color or color word. They will cover a space on the activity mat to match the color. They will continue to play until all of the spaces are covered. You can use this as a partner game. Students take turns and the first player to complete their picture wins. The mats can be used with or without the dot cube. If you’re short on time, students can simply use the model image on the mat to assemble the picture using plastic cubes. 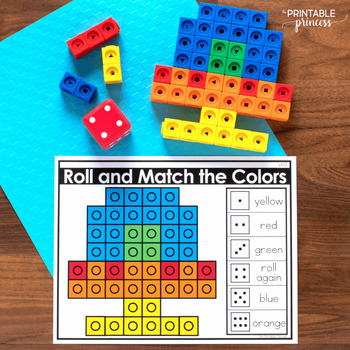 For a longer activity, add the dot cube option and have students assemble the picture once the mat is filled.